The Mighty Crusaders are under attack from the evil Eliminators. It's an action-packed third issue that puts the team at the mercy of a band of supervillains with a secret weapon named Dream Demon. After the last issue where some of the Crusaders questioned The Shield's leadership, issue three finds little time for inter-squad drama and a whole lot of time for all-out war. The two teams go at it from splash page to panel after panel. Kelsey Shannon choreographs an exciting series of confrontations that convey a great deal of impact on each combatant. We listen to Steel Sterling's inner monologue as the road-weary veteran who's faced the Eliminators many times before. All that fighting seems to have taken a toll on him. Ian Flynn slyly uses Steel's monologue as a way to introduce some of the Eliminators to the reader and it works without being awkward. 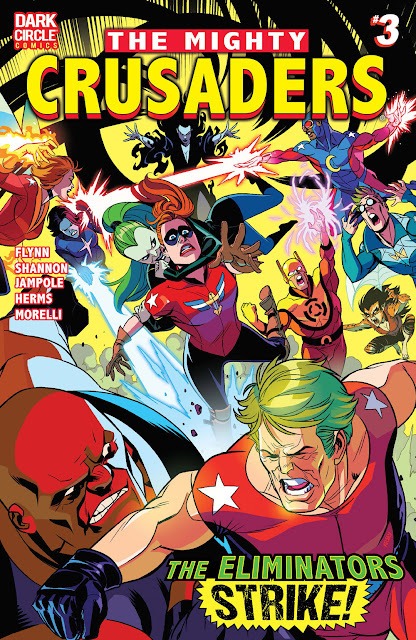 Flynn evokes some classic superteam clashes like the Justice League versus the Injustice League or similar and the result is a rousing battle with some surprising turns. One of those is the powerful Dream Demon with the power to bring your greatest nightmares to life with a touch of her hands. Nothing comes easy for the Crusaders. Meanwhile, the subplots are brief but preview a bigger fight looming for our heroes. A major force is awakened in Eternos who seems like the Thanos/Darkseid villain of the Dark Circle universe. It's all beautifully rendered by Shannon, colorist Matt Herms, and inker Ryan Jampole. Imagine a modern day Jack Kirby comic I think this would be it. The classic character designs with bright primary colors and the simple good versus evil plotting are what makes comics fun and not just for nostalgic reasons. And yet it's deeper than that too. Flynn balances character development with action giving readers what the want in shock & awe while getting to know these heroes. 'The Mighty Crusaders' continues to face conflicts internally and externally. The team has to band together against great odds battling the Eliminators. A new villain turns out to be more formidable than anyone thought while an even greater threat emerges. This is an old-fashioned comic book superteam that is rousing and exhilarating. Flynn and company have created a sort of throwback that cuts to the chase and leaves you hanging on every page.